A few weeks ago, I found myself counseling two of my friends, Simon and Chad, who had gone from enthusiastically co-founding a successful tech company in Silicon Valley to passive-aggressively bickering with each other at every turn. While they had started out working closely with each other every day, the requirements of running a successful business over the years had caused their working relationship to drift apart. Eventually, their resentments of the other condensed into a dark cloud that hung over the company — clearly visible to both employees and to customers. This dramatically affected morale and investor confidence in the company. When I sat down with them, it was clear that they mostly still agreed on the direction of their company and that both still valued the other deep down. It was their lack of understanding each other’s perspective, coupled with a resistance to talk honestly about their feelings, that led to the tension between them — a tension that was now compounded by the stresses of a dry sales pipeline and delays in the product release schedule. Their focus, unfortunately, was fixated on how the other was to blame for the downturn, and was blind to where they were in alignment. After helping them take accountability for how they personally contributed to their current situation, I outlined the importance of welcoming empathy into their relationship. Put simply; empathy is not the same as sympathy — which is the concern for another’s welfare, whether or not there are shared emotions. Empathy takes sympathy one step further. It’s when you allow yourself to experience and relate to the thoughts, feelings or experience of others. 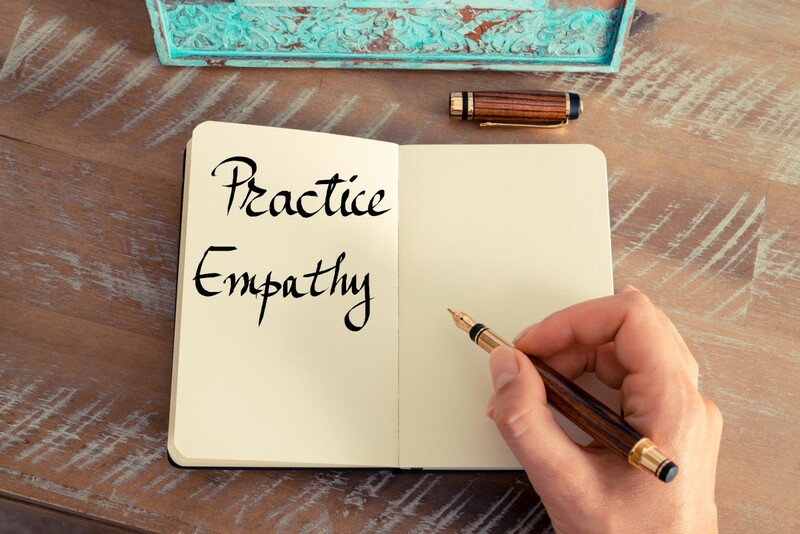 Empathy happens when you imagine what it’s like to actually be living the other person’s life in that moment — when you mentally and emotionally “walk a mile in their shoes,” as the saying goes. The tendency to be egocentric and think of ourselves first is an evolutionary survival mechanism. However, when we make rash or quick decisions (usually fueled by stress or the fight/flight response), empathy is dramatically reduced. Having empathy for people — whether they are your family, friends, co-workers or complete strangers — does more than allow you to understand what another person is going through, it allows you to bond more deeply with people. Fortunately, there is a part of our brain called the right supramarginal gyrus that recognizes a lack of empathy and autocorrects. When the supramarginal gyrus engages, the hormone oxytocin releases into our bloodstream. A strong body of evidence suggests that the hormone affects the neurons in our brain to make it easier trust each other and increases the desire to spend time with each other. In times of conflict, oxytocin can increase positive communication and decrease stress levels helping both parties find a resolution. The chemical helps us bond with those close to use, and feel as if we are all a part of the same tribe. By consciously engaging our right supramarginal gyrus and putting our attention on others we can actively cultivate the experience and the benefits of empathy in our relationships. In romantic relationships, research reveals that partners who are empathetic are more satisfied with their relationships than those who are less empathetic. Interestingly, those who were empathetic with their partner’s positive emotions reported five times higher satisfaction with their relationship than those who empathized only with negative emotions. In fact, authentically expressing positive empathy not only impacted satisfaction in the relationship, but also in general life satisfaction, as the emotional states of both empathizer and recipient became more positive overall. This effect is called Crossover Capitalization. This positive impact of Crossover Capitalization can be experienced in working relationships as well, as empathy’s effect on our minds is the same, regardless of the type of people we are interacting with. In the workplace, empathy can help boost productivity and sales. Empathy fuels collaboration because people feel others on their team honor their concerns and feelings. Google’s Project Aristotle revealed how empathetic teams experienced more equality, shared more talk time in meetings, and were more willing to address team member dissatisfaction at the moment, rather than ignoring it in the hopes that it might go away. Curating an empathetic leadership style also results in motivating teams to do their best work, by acknowledging the contributions of others, cultivating a shared vision and building loyalty. Listen and don’t interrupt. Hold your tongue when others are speaking, and wait until invited to share your opinion or offer suggestions. Sometimes all the person needs is to feel heard. Try out phrases like, “I get it,” “that makes sense,” “of course you feel that way.” When expressed truthfully words go a long way. Always assume good intentions. When things go wrong, which they will, or disagreements arise, always start with the assumption that everyone is doing their best and is working for the good of the company. Starting with this one simple premise will dramatically improve communication and reduce the or eliminate the otherwise negative compounding impact of such events. Instead of turning to blame or shame, focus quickly shifts to working together towards a solution. Follow the Platinum Rule. Doing unto others as you want done to you sounds good in theory but it doesn’t necessarily work. Rather than assuming we all think the same way and want the same things, treat others as they would like to be treated. Take the time to understand your partner’s values and preferences and adjust your behavior accordingly. Share good things that happened to you each day with your partner. Take advantage of that Crossover Capitalization. Sharing your positive items and hearing your partner’s will generate a beneficial emotional boost in each other and in general. Celebrate every win, no matter how small. Each time one partner secures a win towards a goal, celebrate it with them. Do a happy dance, bang the gong in the office, open up a bottle of champagne. It doesn’t matter what it is, so long as it’s something special that marks a celebration. Meet for Founder’s dinner once a week or say an extra day after a trade show. By socializing and enjoying downtime together outside of work, the two of you will have a chance to unwind and talk about things beyond your business, allowing you to deepen your relationship. These are just a handful of tips that can help create lasting bonds in all of your relationships. They can boost positive empathy and positive emotions overall, opening you and your partner up for stronger, more resilient relationships that can stand the test of time. What’s one relationship in your life (personal or career) where strength as waned over the years? Regardless of the cause, how can you employ a little empathy to understand where the other person is coming from, or might be feeling? Which of the six tips listed above are you willing to implement this week, as a way of strengthening your relationship?